Since the early 1960’s, I have spent part — usually the better part — of my summers in Western Maine. The distinctive mountains, pine trees, granite outcroppings and deep blue lakes that I know so well were all subject matter for the Maine painter Marsden Hartley (1877-1943). Even without my own familial association with Maine, I would love Hartley’s work, which is moody, compelling and illustrative of so much about the character (and the characters) of the state. Yes, he made some remarkable paintings in Germany and New Mexico as well, but the paintings of his home state — of Mt. Katahdin, lobster fishermen and the clouds that I can still see floating over our lake in Western Maine — remain fresh and evocative to me. 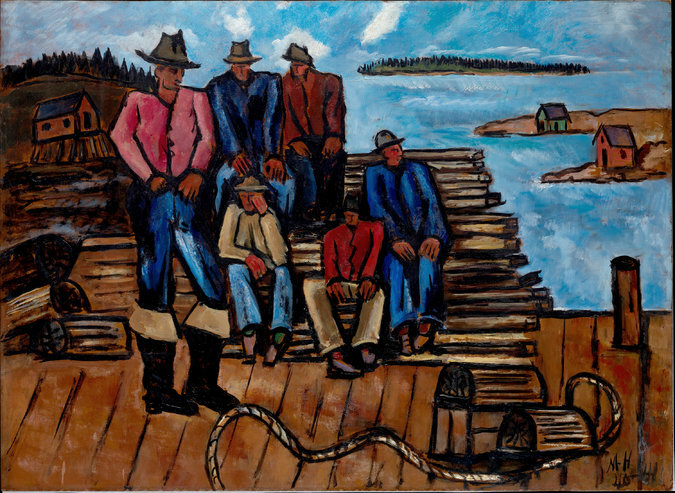 Now we can all see this work at The Met Breuer in New York, which has just opened Marsden Hartley’s Maine, through June 18, 2017. If you’re heading to Maine this summer, you have another chance to see the show when it opens at the Colby College Museum of Art, where the exhibition will be featured from July 8 through November 12, 2017. If you go,Visit Maine has come up with a series of great driving itineraries where you can travel in the painter’s footsteps.